Hey there friends, patrons, and fellow mythical astronomers! LmL here, and boy do I have a good episode for you today. It’s actually going to be another double feature, where I release two episodes about 3 days apart, simply because it seems more fun to do that than release one two and a half our episode. The overarching topic throughout both episodes will be the stolen Other baby who became the progenitor of House Stark, and specifically, we are going to focus on the last hero aspect of this archetype. So if you’ve ever wanted more Stark in your mythical astronomy, you’re in luck. If you’re tantalized by the hints of an ancient connection between Stark and Dayne, these episodes are for you. In fact, this first one particular is going to be a Stark / Dayne / last hero sandwich, and doesn’t that sound appealing. I’m also going to hit you with some brand new sources of inspiration for ASOIAF that we haven’t covered before on Mythical Astronomy, at least not in any detail. Those sources would be none other than Michael Moorcock’s Elric of Melnibone, and some specific parts of J.R.R. Tolkien’s Lord of the Rings and the Silmarillion. As you will quickly see, Martin drew on the fiction of these two authors pretty heavily when he fashioned certain elements of ASOIAF like the last hero, the Sword of the Morning and House Dayne, Valyrian steel, Valyria and the Great Empire of the Dawn, and House Stark. In this first episode, we will explore these influences, and we will rip into all the connections that House Dayne and House Stark have to the last hero – connections which center around our stolen Other baby archetype. In the next episode, we will dive back into the ASOIAF text for some close analysis of the great characters who play this archetype, mostly from House Dayne and Stark, but also from a lesser known Westerosi House known as House Seaworth. Davos’s scenes at the Wolf’s Den in White Harbor in ADWD are some of my very favorite chapters, and we will be diving into the unbelievable symbolism locked away inside those black stone walls of this ancient fortress of the First Men. Thanks to George R. R. Martin for giving us so much to talk about, and thanks above to out Patreon sponsors for their undying generosity and support. Just when you thought you weren’t able to abide any more bards or baleful name games, they abate. The baelishness and bardishness abates, anyway, but not the name games. That’s right; exit Bael, and enter Eldric Shadowchaser, because one of the other possible names for our frozen ice dragon baby is indeed Eldric Shadowchaser. And what a name it is! It is the colour of a bleached skull, his flesh; and the long hair which flows below his shoulders is milk-white. From the tapering, beautiful head stare two slanting eyes, crimson and moody, and from the loose sleeves of his yellow gown emerge two slender hands, also the colour of bone. Sound like someone you know? It’s Bloodraven, essentially, complete with bleached skull, milk white hair, and crimson eyes. Bone white hands are something we find on the Others, interestingly, and of course the white bark of the weirwood is always described as “bone white.” That’s pretty good – Bloodraven is clearly, clearly fashioned from the impression that Elric of Melnibone left on George’s mind – but as always, it it gets worse. Elric of Melnibone is a genuine, bona fide magic sword hero, and his magic sword is a black one called Stormbringer. This ‘Stormbringer’ swallows the souls of those it slays, and basically brings doom to everything it touches and to everything beloved of the one who wields it. On the ASOIAF side, we know that Lightbringer (seriously, Lightbringer, Stormbringer) is said to be a soul-drinking sword as well, since the legend states that Lightbringer drank Nissa Nissa’s soul. And as you must surely have noticed, I’ve spent the last three years proposing that Lightbringer was actually a “dark Lightbringer,” or a “Nightbringer” – a black sword and a prototype to Valyrian steel, in other words. And in regards to the idea of Stormbringer bringing doom and destruction to everyone who wields it, you’ll surely recall my theory about how the forging of Lightbringer cracked the moon and in some way represents the cause of the Long Night. Plus, right there in the myth itself, we have Lightbringer beginning its existence by demanding the life and blood and soul of Nissa Nissa, which fits the idea of a cursed sword. Thematically, Elric struggles with alienation, very like the Hamlet / Kullervo mythical figure who seem to have inspired Moorcock. This theme is certainly present with Bloodraven’s story, and it’s a similar alienation borne out of possessing extraordinary knowledge and power, and the responsibility that comes with those things. In other words, Bloodraven and the basic myth of Lightbringer take obvious inspiration from Elric of Melnibone, and if my theories about dark Lightbringer, Azor Ahai, and the Long Night are close to the mark, then you can see that Martin was actually drawing from Moorcock’s ideas even more than it appeared at first. The point of pointing all this out, besides it being cool and interesting, is to show you that it makes perfect sense for George to pull these elements of Moorcock’s Elric into the Azor Ahai mythology, as he does by naming Eldric Shadowchaser as one of the five known epithets of the flaming sword hero who ended the Long Night. Learning the basics about Elric of Melnibone helps us understand part of the context from which Azor Ahai was fashioned, and you have to admit that it’s a big point in favor of the “dark Lightbringer” theory and the “Azor Ahai caused the Long Night” theory. As a matter of fact, one of the other of the five names that TWOIAF gives for the flaming sword hero, Hyrkoon the Hero, is also an Elric of Melnibone reference – in Moorcock’s world, Elric’s cousin and heir is named Yyrkoon, who actually turns out to be something of a rival and enemy. To me, adding the name of Elric’s cousin and heir to the Azor Ahai name list seems like a clue for us to think about multiple Azor Ahai heroes that may descend from one another, and may have fought one another, as we’ve been discussing for a long time, especially in the Baelful Bard episode where we picked up on a ton of stories about people warring with brothers, sons, grandsons, fathers, and grandfathers. Multiple Azor Ahai figures that are related to one another is really the only way to explain the fact that so many of the main characters show some combination of Azor Ahai, last hero, and Night’s King symbolism, and the fact that each generation often seems to repeat the symbolism of their parents. Put simply, Martin is literally folding two enemy cousins, Elric and Yyrkoon, into one flaming sword hero monomyth, and I think this can only be a clue that the Azor Ahai figure may in fact apply to more than one person – just as we think the Azor Ahai reborn title applies to at least Jon and Dany, and who knows how many others (chuckles). Along the same lines, we find that Elric of Melnibone has two other cousins of note – there’s Dyvim Tvar, one of the “Dragon Masters” who can speak to dragons and fights alongside Elric with another black sword, this one called Mournblade. Yeah, a black sword of the morning, eat it up guys. It’s a black mourning sword, and right next to Stormbringer. Elric’s other cousin is a woman named Cymoril, whom Elric hopes to marry and make his queen. Jon will be marrying his aunt, potentially, and Bloodraven was in love with his half-sister. Oh, and I suppose I’d be neglectful if I didn’t mention a couple of the titles of some of the short stories that comprise the Elric saga: “The Flame Bringers,” “The Black Sword’s Brothers,” “The Bane of the Black Sword,” and “The Weird of the White Wolf” …I kid you not. Now, I will just say, one more time, that when Jon is resurrected, I think he will have “milk white hair” and possibly “crimson eyes,” like his weirwood-colored white wolf, and like Bloodraven… and like Elric of Melnibone. He’s already got the black sword and a sense of doom, plus a weird white wolf, so… there you go. I sometimes get crap about now making enough predictions, so I’ve been trying to point them out when I make then lately. I officially predict that Jon will be Elric of Melnibone when he awakens… and he might even bring a storm with him. A snow-storm, naturally. 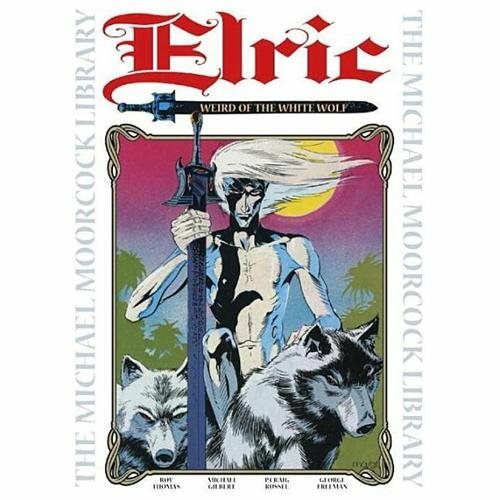 Now that we’ve taken our crash course on Moorcock’s Elric, we understand the Eldric part of the Eldric Shadowchaser name. As for the Shadowchaser part, well, on a very basic, descriptive level, “shadow-chaser” makes a lot of sense as a moniker for someone who fought with fire and light to end the darkness and shadow of the Long Night – he’s chasing the shadow away…. very straightforward. Presumably, he fought the white shadows known as the Others, so the shadow-chaser epithet works even better, as he is literally chasing shadows at that point. The eastern legends of the flaming sword hero speak of the demons of the Lion of Night ravaging the land during the Long Night, which might amount to a similar sort of shadow-chasing that needed to be done in the far east. But as I was saying earlier, the weird thing is that unlike the other four names we are given for the flaming sword hero, the name ‘Eldric’ doesn’t have any linguistic matches to any names or words from Essos. It does, however, find a bunch of echoes in Westeros – namely, in the Houses of Stark and Dayne, the two houses with strong ties to the last hero, who is the closest thing to a Westerosi version of Azor Ahai! With all that comes with the Eldric name, can this really be a coincidence? Stark and Dayne? As it happens, taking a quick glance at the Eldric-derived names of Westeros reveals much. Down in the crypts of Winterfell, we find a legendary King of Winter known as King Edrick “Snowbeard” Stark. That’s got to be one of the best nicknames in the whole series, and he certainly sounds like a guy who might have an affinity with ice magic – or more specifically, his name sounds like a clue to us readers about a Stark ancestor with an affinity for ice magic. The same goes for the name of his great-grandson, Brandon “Ice Eyes” Stark… the First Men may not have had writing, but they sure knew how to pick a great nickname, huh? In more recent history, there’s also a non-snowbearded Edric Stark (presumably his beard is more standard and made of hair), as well as an Elric Stark, who Ned’s great great great grandfather. Ah ha! Elric of Winterfellnibone (sad trumpet sound). Bad jokes aside, with two Edric(k)s and one Elric in the Stark family that we’ve heard of, we have to wonder whether Eldric Shadowchaser might be an ancestor of the Starks – and this would make sense if Eldric Shadowchaser was a name for the last hero and / or the stolen Other baby. Eldric and it’s variants could be a family name dating all the way back to the Long Night, just as the name Brandon appears to be. 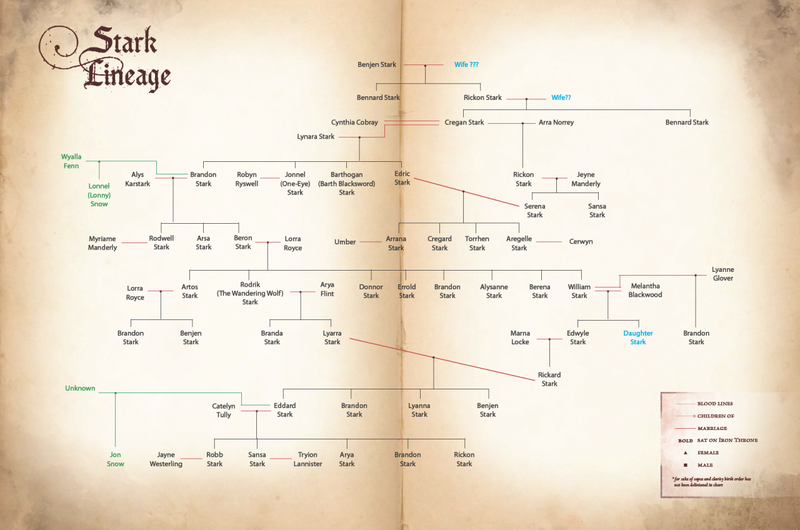 Consider this: in the back of TWOIAF, George gave us a recent family tree for House Stark, which goes back about two centuries, and within that short time, we find Elric Stark and the non-snowbearded Edric Stark. If we had two Eldric variants in recent history, and at least one in ancient history, it really seems like it could be a Stark family name that dates back to at least King Edrick Snowbeard’s time, and perhaps before. For context, in that same 10 generation family tree, we find 7 Brandon variants (I’m including one Branda), 4 Benjen’s (and 1 Benedict), and one or two predecessors for Sansa, Arya, Rickon, and Lyanna. We also find lots of variants of the same name: Cregard and Cregan; Arya and Arra; Lyanna and Lynara and Lyarra and Lysara and Lysa, and so on and so forth. Thus Elric and Edric/Edrick make sense as derivatives of Eldric. That’s quite the trio, isn’t it? As I mentioned last time, there’s a decent chance we could see Darkstar wielding Dawn in the Kingsguard of ‘fAegon Blackfyre’ (Young Griff), who may have had the Targaryen family sword Blackfyre delivered to him by Illyrio, so we may yet see these two fabled swords in the same room together – Blackfyre and Dawn. Expect there to be mythical astronomy! Predictions aside – and yes, there’s another prediction, angry guy on the YouTube comments – once again we have to say that it makes sense to see an Elric variant, Ulrick, wielding a magic sword – a sword which may have once been the original Ice of House Stark. I don’t know about you, but I am basically sold on that idea. The symbolic match between the Wall and Dawn is just too overwhelming, especially in light of all the other evidence. Anyway… that stuff is in Moons of Ice and Fire 2: Dawn of the Others if you want to brush up on it. Better still, the current young lord of Starfall, the next Dayne in line to have shot at being named Sword of the Morning is… young Edric Dayne, who is in turn named for a Stark – our beloved Eddard! (Edric’s nickname is Ned) That’s right, this Edric is a Dayne… named after a Stark! Ned Dayne has previously been viewed as a curious clue about the Tower of Joy, one which raises the question of why the Daynes would name a child after Ned, who is said to have slain Arthur Dayne in single combat. But now, it’s kind of a bonkers clue – this is a big confirmation that this Eldric Shadowchaser thing is in fact an archetype, one which is tied to the Daynes and the Starks. In other words, not only does the Eldric name find all these echoes in both their houses, the one we have alive today, Edric Dayne, is tied to both houses, being a Dayne named for a Stark. Another take-away here is that the Daynes apparently consider “Edric” a variant of “Eddard,” which kind of opens up a different can of worms – it means we are going to have a look at the Ned as another echo of this figure! We’ll actually have to save that for next episode, in order to take the appropriate time and energy for Ned and Winterfell, which kind of go together. Plus it’s always good to have something to look forward to. In any case, thinking of Eddard as an Eldric variant causes us to notice that the recent Stark family tree also has an “Edwyle,” an “Edwyn,” and a fellow that goes by the uber fantasy-sounding name “Edderion Stark.” If those names can be counted as part of the Edric / Eldric / Elric family of names, then this is easy to spot as a Stark name. A Stark name which they apparently loan to the Daynes, or something. I said at the beginning that both the Starks and Daynes are connected to the last hero, and this is basically the point of all the Eldric names being found in House Stark and House Dayne. We are going to take a more in-depth look at the various Eldric characters of Stark and Dayne, particularly Ned Dayne, plus we’ll check out a couple of other folks who fit the pattern – but first, I’d like to talk about how the last hero mythology is firmly rooted in the Houses of Stark and Dayne. It’s a fun topic, so I assume you all are okay with that. This will give us the appropriate context to analyze the Eldric figures of Stark and Dayne (and yeah we’ll get Edric Storm too, don’t worry). Plus, I have some pretty tasty new last hero-related mythology which is going to knock your socks off. We’ll start with House Dayne, beginning with their origins. It’s no secret that people in the fandom have been looking at House Dayne, their glowing magical meteor sword named Dawn, and the Sword of the Morning title for many years now and thinking that surely, this must have something to do with Lightbringer. It’s apparent pretty early on that the legend of Azor Ahai and Lightbringer, which come from the region of Asshai and Yi Ti, is somehow important to the Westerosi story, and that’s only become more true over time. Therefore, it seems obvious to us readers that the Azor Ahai story has to intersect with Westeros somehow, and House Dayne, this weird family with occasionally purple eyes and silver hair who just happen to own a magical glowing sword named after sunrise, would seem to be the likely suspect. They kind of stick out like a sore thumb in fact. As some of you know, before TWOIAF ever came out, some in the fandom had speculated about the Daynes having a distant common ancestor with Valyria, including Elio Garcia, who along with his wife Linda Antonsson, both created Westeros.org and helped George write TWOIAF. And then TWOIAF came out and gave us the Great Empire of the Dawn and the Bloodstone Emperor and all the rest. As Aziz from History of Westeros and I laid out in our video series about the Great Empire of the Dawn, the evidence strongly points to the Great Empire as that common ancestor of Valyria and House Dayne. According to our theory, these would be the people who built Asshai, the Dawn Age dragonlords from the east that have been rumored since Dany’s first chapters of AGOT. It’s very possible that House Dayne was founded by the child of Azor Ahai and Nissa Nissa, who may or may not be the same person as the Amethyst Empress, the last rightful ruler of the Great Empire of the Dawn who seems to have had silver hair and purple eyes, the trademark dragonlord features. Speaking more generally, the Daynes would seem to represent a merging of this ancient, pre-Valyrian “blood of the dragon” and the blood of the First Men, which seems to be part of the formula for making a last hero (someone, like oh say, Jon Snow). Essentially, The Great Empire of the Dawn theory shows a plausible and even probable mechanism by which the Daynes may have come to Westeros from the far east, perhaps even from Asshai itself (which I believe to have been the former capital of the Great Empire of the Dawn). Then, also in TWOIAF, George gave us a name for the flaming sword hero, Eldric Shadowchaser, which matches a couple of members of House Dayne, which only adds more fuel to the fire for those who see Dawn as Lightbringer and / or the dragonsteel of the last hero. Now most of you reading this will already be familiar with the Great Empire of the Dawn theory, but today I have a special treat for you. I’m going to show you an entirely new line of evidence to support the “House Dayne descends from the Great Empire of the Dawn” theory – and we’ll do that by opening up a portal into Middle Earth. Meaning, we’re going to draw upon the Lord of the Rings knowledge of my good friend Blue Tiger, who translates Mythical Astronomy of Ice and Fire into Polish, which by the way is an impressive feat! If you follow me on Twitter ( @thedragonLML ) then you have probably seen some of Blue Tiger’s Lord of the Rings / ASOIAF commentary, and the correlations between House Dayne and Tolkien’s Dunedain are some of the most striking (by the way, Blue Tiger is @lordbluetiger on Twitter). I think I can do this without diving too deep into Middle Earth, which is a very deep can of worms, let me tell you. I’ll also give a hat-tip to good friend Joe Magician, who contributed to the following information as well. He’s got a new YouTube channel by the way, with a “how to make a weirwood” video that you really need to watch, so check that out. It starts with Atlantis. Atlantis is one of the coolest myths in all of world mythology, and it’s irresistible to fantasy authors. Both J. R. R. and G. R. R. have created their own versions of Atlantis – George’s is, for the most part, the Great Empire of the Dawn / ancient Asshai, and there’s also a whiff of Atlantis around the Doom of Valyria, though Valyria correlates more strongly to Rome and Nazi Germany. In Tolkien’s universe, Atlantis is called Numenor (although there’s also a whiff of Atlantis in the ‘sinking of Beleriand’ story as well). In both cases, the likeness is very striking. Numenor is a lost golden land, specifically an island, which sunk beneath the sea after mankind became too proud and sinful, with the survivors emigrating to the remaining dry land, which is Middle Earth, and founding new kingdoms. In fact, the “survivors founding new kingdoms with remnants of the lost knowledge” idea is a major component of the Atlantis myth, even thought the flood and land subsidence gets more attention. Many world cultures have a myth of a lost golden land that sunk beneath the waves, with their survivors becomes the first sages or kings of new civilizations such as Egypt or the Mesopotamian civilizations of Sumer, Akkad, and Assyria, and we even find similar myths in North and South America. This is the context in which we should read the quote from TWOIAF about the possibility of people from the shadowlands by Asshai teaching the Valyrians to tame dragons before vanishing from history. The same goes for the idea of pre-Valyrian dragonlords coming to Westeros to build the fused stone fortress on Battle Isle, or, of course, to found House Dayne. So back over in Tolkien-land (which is called Arda, by the way), the human survivors of the fallen, Atlantis-like Numenor are called the Dunedain. Dunedain, Dayne; that’s right. The Dunedain are the men who founded Gondor and Arnor, the main human kingdoms we see in Lord of the Rings (Minas Tirith is the capital of Gondor). Before the Dunedain came to Numenor, they were called the Edain, which is the plural form of adan, which means “men” in Quenya, Tolkien’s made-up elf language. A final note on Orthanc – after Aragorn triumphs and takes the throne of Gondor as King Ellesar, he gives Orthanc and the surrounding area over to the tree ents of Fangorn forest, and they grow a new forest and call it “the Treegarth of Orthanc,” and here you can see that the trap / prison implication of garth is being played upon, as well as the “enclosed garden” meaning of the word garth. The leader of the Dunedain when they fled from sinking Numenor was Elendil, whose two famous sons were Isildur and Anárion. You don’t have to be steeped in Tolkien lore (like Blue Tiger or Joe Magician) to recognize the names Elendil and Isildur, because Aragorn, the rightful king of Gondor, is called “Isildur’s heir,” and the famous sword that Elrond of Rivendell reforges for Aragorn is called “the sword of Elendil.” It’s actual name is Narsil, and Narsil is where this correlation really heats up – Narsil means “red and white flame” in Quenya. A sword of red and white flame that belongs to the Dunedain, huh? Yeah, it sounds familiar, since Dawn is a white sword and Lightbringer is said to have burned red. For what it’s worth, Elendil translates to “star lover,” while Isildur translates to “devoted to the moon.” My kind of folks! It’s notable that the one playing the Isildur role here is a Stark and the King in the North, and that this story is being told to Jon Snow, the special dragonglass snowflake. So, with all that said, you can surely see the overall correlations which are stacking up. The Dunedain came from fallen Numenor, bringing with them a magic sword of red and white flame. In the new land, this magic sword was broken in a final battle against a dark lord, but was still used to win the battle. House Dayne may have been founded by survivors of the fallen Great Empire of the Dawn, who may have brought with them a magic white sword which may have the ability to catch fire. A Dayne may have become the last hero, whose sword was broken in a final battle against the great enemy – either the Others or Night’s King himself – and yet that sword was either reforged or replaced and still used to win the battle. The correlations continue into the present day story of both universes, as thousands of years later, a descendant of the Dunedain, Aragorn, wields Narsil once again while leading the armies of mankind against the great evil, and in ASOIAF, we find that our two primary manifestations of Azor Ahai reborn who seem destined to fight the Others, Daenerys Targaryen and Jon Snow, have Dayne blood coursing through their veins. It’s even possible that Jon could get his hands on Dawn. There’s another layer to the story of the Edain and Numenor which George is drawing from as well, because before the Edain came to the island of Numenor, they actually lived in kingdoms in the lost land of Beleriand, where most of the events of the Silmarillion take place (Beleriand actually adjoins the current lands of Middle Earth, just to the west of the current coastline). The Edain are essentially the kingdoms of men who stayed loyal to the elves and did not worship Morgoth (who is Sauron’s evil predecessor), and who fought alongside the elves against Morgoth during the great wars. Even though the elves and the Edain were victorious, the violence was so great that most of Beleriand sunk beneath the sea (it was actually the slaying of a huge dragon, Ancalagon, that caused the land to sink). In any case, the Valar (the gods, essentially) rewarded the Edain for their loyalty and raised the island of Numenor from the sea, far the west. Numenor was also called Westernesse or Elenna, which means ‘Starwards.’ Numenor is actually shaped like a five-pointed star, with Mt. Meneltarma (Pillar of Heaven) in the middle. Tolkien conceived of his tales as having existed in the ancient past of earth, and placed Middle Earth approximately in line with Europe, which places Numenor in the Atlantic Ocean, where Atlantis was supposed to have existed. Another side note – you may have noticed the word Valar, the name of the gods. I mean, Valar Targaryen and Valar Morghulis, and oh-by-the-way Morghulis comes from Minas Morgul, the city of the wring wraiths. Minas Morgul is used to be called Minis Ithil, the city of the moon, before it was corrupted (in now radiates a pale “corpse light,” a phrase we recognize as one borrowed by George R. R. Martin). So, Valar Morghulis, translated into Tolkien language, actually means “the gods of the corrupted, corpse-like moon city” – how do you like that? This is one of several Tolkenic ideas which may have inspired Martin’s ideas about a corrupted and fallen moon. Here comes the heavy parallels to House Dayne: to find Numenor, the Edain, led by Earendell (the same guy who slew the dragon Ancalagon) sailed westwards, following Venus, which Tolkien calls “The Star of Earendil.” If they followed a Venus-analog west, that means it would have been in its Evenstar position, when it appears to fall from the heavens at sunset and sink into the horizon. Hmm, that sounds familiar – like the Daynes, they followed a falling star to reach their new homeland… which was in the shape of a star. It’s possible this is the sense in which the Daynes followed a falling star to their new land – it might simply be a fancy way to say “they sailed west, and they like Venus. Ar-Pharazon Tar-Calion, (Pharazon means The Golden, Calion means Son of Light). The Usurped Queen has a name connected with gemstones (Miriel = Jewel Daughter; Amethyst Empress) and silver hair associations too, because Tar-Miriel was named after the elf queen Miriel, the uniquely silver-haired mother of Feanor, who might be the most Azor Ahai-like of anyone in the Silmarillion being a smith whose spirit was so fiery that his corpse self-combusted upon his death. Feanor made the Palantiri, the seeing stones such as possessed by Saruman in The Lord of the Rings. Thanks once again to Blue Tiger for digging up these correlations, and one day if you are lucky I will sit down with him and do a whole episode on Lord of the Rings / ASOIAF correlations… let me know how interested you guys are in something like that. In any case, I’ve included this info here not only as a way to add evidence to the “Daynes come from the Great Empire of the Dawn” theory, but also to show that House Dayne has even more connections to the last hero and his sword of dragonsteel that would first appear. What I mean by that is this: the Daynes, along with their neighbors, the Hightowers, sure seem like George’s version of the Dunedain, with both Dayne and Dunedain being heavily, heavily based on Venus mythology. And what else is based on Venus-related ideas? The last hero and Lightbringer of course, and the symbolism of both the last hero and House Dayne sure seems to draw a lot from the famous magic sword of the leader of the Dunedain, Narsil, the sword of red and white flame which was broken and reforged. All of this is quite suggestive of a Dayne last hero, with Dawn as his sword of Dragonsteel which may have also been remembered as Lightbringer… or perhaps some of twist or inversion of that idea. It’s interesting because the Sword of the Morning is Dawn, which is a white sword, while the Night’s Watch wear black and pronounce themselves the “swords in the darkness” and their ideal weapons are always black – either dragonglass or Valyrian steel. Yet despite the color difference, the symbolism of the Night’s Watch and everything related to the Sword of the Morning and Dawn are virtually identical, and that’s because the Night’s Watch symbolism also flows from Venus mythology (and if you’re foggy on that, check out Bloodstone Compendium 6: Lucifer means Lightbringer). With all the Morningstar symbolism shared by Dawn, the Sword of the Morning, the Night’s Watch, and Lightbringer, it really would make a ton of sense if Dawn is the dragonsteel of the last hero story – and that’s why it has always been a popular theory in the fandom. That’s right – long before I made the connection that thousands of dragons coming from a cracked moon were probably meteor dragons, some clever people somewhere had already put together the idea that any sword made from a meteor could be considered “dragonsteel” in a very real sense. A meteorite, which can contain a ready made steel alloy (that is, iron that contains a bit of nickel or phosphorus), would also begin to explain the presence of an advanced sword in ancient, pre-Andal invasion Westeros, which is another thing that has made the theory popular. I know I have proposed that Dawn was the original Ice of House Stark – and I do believe that to be the case – but that doesn’t necessarily mean it came from the north, only that it was used by a Stark hero of old and that it started the tradition of the Starks naming their swords Ice. It certainly may have come from the North, and we are going to talk about that more in a minute, but the other credible origin theory about Dawn is that it came from the Great Empire of the Dawn in the hands of the first Dayne settlers, which would of course fit the correlation with the Dunedain bringing Narsil with them when they fled Numenor. As my friend Durran Durrandon first noticed, a glowing white sword like Dawn is a potential match for the “swords of pale fire” held in the hands of the gemstone emperors in Dany’s wake the dragon dream in AGOT. The Great Empire of the Dawn were supposedly a very advanced civilization, and in control of dragons for a least some part of their history, so they also provide a logical answer to the question of who would have been able to forge a sword like Dawn, which the maesters describe as being like white Valyrian steel. It’s possible they didn’t bring Dawn from their former homeland, but simply the metallurgical and magical knowledge needed to forge it, which they may have then done in Westeros. If Dawn’s origins do lie with the Great Empire of the Dawn, then perhaps it was only used the one time by a Stark when he was in fire need of help against the Others – think of Arthur Dayne at the Tower of Joy as “loaning” the sword to Ned, ha ha. A better correlation might actually lie in the future, if circumstances lead to Jon “borrowing” Dawn from House Dayne for the final battle. Like I said, Jon does have some ancient Dayne blood, passed down from Egg’s mother, Dyanna Dayne, so maybe it won’t even be a loan, but it would still read that way – the Daynes as keepers of Dawn who give it to Stark when dire needs arises. There’s a decent bit of evidence that the dragonlord settlers from the Great Empire of the Dawn who built the Battle Isle fused stone fortress had communication with the children of the forest when they came to Westeros – it may have even been the point of coming – so perhaps the children somehow facilitated a transfer of Dawn to the last hero after he broke his first sword. Perhaps that was part of the help which the children gave to the last hero and the Night’s Watch – they gave the men of the watch dragonglass, and they gave their leader milkglass, ha ha. When our hypothetical Stark last hero was done with his big white sword, perhaps he returned it to the Daynes, as Ned – who is an Eldric figure, remember – returned Dawn to Starfall after the Tower of Joy. After the battle was won and the sword returned, perhaps the Starks simply started a tradition of calling their swords ‘Ice’ in remembrance of the big white glowing sword that could withstand the cold. As much as I like that theory, and as neat and tidy as it seems (I mean, Dawn, Great Empire of the Dawn, right? ), there is a strong case to be made that Dawn’s origins do lie in the North, and that it does possess a more tangible connection to ice magic and the Others and ancient Starks. This will lead us into the Stark connections to the last hero mythology, so it’s time for a witty new section title. So, he goes north – into the dead lands – to seek the children, eventually his first sword breaks from the cold while he’s fleeing the Others. As for what happens next, both Old Nan and the maesters say that the last hero received some kind of help from the children of the forest, and then shows up at the final battle with his sword of dragonsteel, slaying the Others, chasing the shadows, and bringing the dawn. Point being, it kinda seems like he gets his new dragonsteel sword in the north, right? He’s already in the north when his sword breaks, and then gets help from the children, whom he went north to find. Ergo, he must have acquired his dragonsteel in the North – and if Dawn is the original Ice of House Stark, and perhaps even associated with ice magic in some way, you can see how this starts to come together. Perhaps the Dawn story is only partly right – perhaps Dawn was made from a white meteor, but one which fell not at Starfall, but in the Heart of Winter or somewhere else in the far north. Perhaps Dawn was even forged at Winterfell, who knows – maybe Ned dipping Ice into the cold black pond is actually a reenactment of our heroic Stark tempering a newly forged sword in icy water. We can speculate all day, but the point is that dragonsteel seems to come from the north, dragonsteel might be Dawn, and Dawn might have been the original Ice. An alternate scenario which sort of blends the two origin possibilities for Dawn would be the last hero setting out with a sword brought over from the Great Empire of the Dawn, with that sword breaking and then being reforged in the North – perhaps our icy Stark child stolen from the Others used ice magic to do some sort of “cold forging” process involving burning cold blue starfire, but that’s probably a little too fun and high-fantasy of an idea. One can dream though. Now as for the Starks and their connections to the last hero, well, it begins with obvious narrative sense: the Starks are essentially the protagonist of the story, the home team if you will. It seems counter-intuitive in the extreme to think that the last hero wasn’t tied to the Starks in some meaningful way. Bran and Jon are generally regarded as the two people who seem like modern day incarnations of the last hero archetype, and I would agree. As Brynden BFish and Poor Quentyn discussed recently on their new NotaCast podcast, which everyone should listen to if they don’t already, the primary duty of the “Stark in Winterfell” is to set out in their oft-repeated house words, Winter is Coming, and reinforced by the slogan of the collective north, the north remembers. There is always to be a Stark in Winterfell, and he must always remember that Winter is Coming, capital W and capital C (and of course we are talking about the Others here). It’s the same role as the Night’s Watch and the last hero – defending the realm of the living against the Others – and of course the Starks are closely tied to the Watch as well. All of this points toward a Stark last hero. If the icy origins of House Stark theory that we began to lay out in the last episode is true, then the Starks would descend from Azor Ahai’s child by the Night’s Queen. As we have seen, the last hero seems to be either this rescued Night’s King baby or the one who rescues the baby, and either scenario places the Starks right in the thick of things. Old Nan says that Night’s King himself was a Stark, and although my theory tortures that a bit by saying Night’s King was a frozen dragonlord whose stolen baby became a Stark, I still consider Night’s King a Stark in a sense. Alternately, if it was Azor Ahai’s child with Nissa Nissa who became the Night’s King, that person may have had a normal child before giving his seed to Night’s Queen, with that normal child perhaps founding House Dayne and the rescued Night’s King baby founding the Winterfell Starks. This would make the Houses of Stark and Dayne something like cousins or long lost brothers, which would fit the symbolism we’ve seen so far. And hey, if you like anagrams, you can cut the the words Dayne and Stark in half and swap them around and get Dark Stayne, such as the dark stain was left on Azor Ahai’s honor when he slew his wife and broke the moon. Better wordplay may be found by chopping the ends off of both words, which leaves “Day Star,” which is a name for Venus. Eldric Shadowchaser is the Dayne-Stark, and the Day Star. The Daynes have Dawn, which could be the original Ice, and the Starks have a magic sword too, which is the most recent sword to be called Ice. Smoke-dark Ice, with its dark glow, is the most thematically central Valyrian steel sword in the books, and with the possible exception of Dawn, Ice is probably the most important Lightbringer symbol of any sword in the book, as I have written about extensively. Although is Ice is actually very dark grey, it can be considered a black sword because it was carried by a Lord of Winterfell named Barthogen Stark, who was known as Barth Blacksword (and who was the brother of Elric Stark). Thus, Ice can be thought of as “Black Ice,” and this is a symbol which in my opinion also refers to dragonglass, which is black frozen fire. Both forms of black ice – Valyrian steel and dragonglass – kill the Others. A couple of episodes ago, we even looked at the Ser Barristan chapter in ADWD that follows immediately after Jon’s death scene, a chapter which opens with a “black dawn.” Then I made a wordplay sandwich about how if Dawn is like white Valyrian steel, then a Valyrian steel sword is like a black Dawn sword, which makes thematic sense as black dawns are what we would have had during the Long Night, when the smoke darkened the skies (and of course Valyrian steel is often described as smoke-dark). I mentioned that if Dawn is the original Ice of House Stark, then it’s a “White Ice” counterpoint to Ned’s current “Black Ice.” This puts in mind of the observation we made a minute ago about the identical Venus-based symbolism of the sword of the morning and the Night’s Watch, despite one being associated with white swords and the other with black. As you may recall, we’ve been given several direct suggestions that the sword of the morning can be a black sword, and always in a Stark-centric context. Both Jon and Robb have scenes where their swords run with morning light: Robb is sitting enthroned as the King in the North when it happens to him, complete with sword across his lap and direwolf at his side, and Jon has it happen twice in the chapter when he executes Janos Slynt in perfect imitation of his true father, Ned Stark, executing Gared at the opening of the story. Jon also has that cool scene at the Wall with the Sword of the Morning constellation which is loaded with symbolism and seems to tie Jon personally to the idea of the Sword of the Morning. The only other time a sword runs with morning light is when Joffrey holds up Widow’s Wail at the purple Wedding – but of course Widow’s Wail is simply one half of Ned’s Ice, which brings us right back to the Starks owning the “sword of the morning.” There was also some last hero math in that scene if you recall, with a dozen names being shouted out before someone said “Widow’s Wail!” and gained Joffrey’s approval. He even swung it dangerously near a Kingsguard, forcing him to jump back – it was Balon Swann actually, which is just perfect – a Bael-ish Other with the yin-yang symbolism of the House Swann sigil is essentially a Night’s King figure, post icy-transformation, and therefore just the sort of person you’d attack with a black Stark sword running with morning light. So, on three of the four occasions that a Stark sword runs with morning light, it is a black Valyrian steel sword. The one time it wasn’t Valyrian steel was when Robb sat enthroned as the King in the North – but in that very scene, he was in fact demanding the return of Ned’s Ice. The Stone Kings of Winter he’s imitating have iron longswords placed across their lap – and iron because iron is black, we can see that even the Stark statues wield black swords… at least until they rust away and leave a red stain, implying a red sword! Hopefully I don’t even need to remind you that Ned’s Ice has been reforged into two red and black swords. Robb was also wearing a replica of the old crown of the Kings of Winter in that scene, which is “an open circlet of hammered bronze incised with the runes of the First Men, surmounted by nine black iron spikes wrought in the shape of longswords.” A bronze crescent moon, with nine black swords – that’s excellent mythical astronomy, since black swords come from moon death, and on a more basic level, I think this kind of clinches the black sword associations of the Starks. They name their people after black swords… their crown has black swords… they use black swords… they’re associated with the Night’s Watch, who are black swords… and yet – they are the only ones whose swords run with morning light. A Black Sword of the Morning? A Black Dawn sword? Well as I’ve pointed out, wearing mourning clothes means wearing black (which Cersei says makes one look half-a-corpse). Therefore, the Night’s Watch, the swords in the darkness who wear black and use black weapons, and whose original members may have been half-dead green zombies, can be scene as the black swords of mourning, instead of the white “Sword of the Morning” we all know and love. Martin may have gotten this idea from the cousin of Elric of Melnibone, Dyvim Tvar the dragon master, who wielded that black sword called Mournblade. The spelling even emphasizes mourning, which I’m sure Moorcock did because it was a black sword. It’s similar to naming a sword “Widow’s Wail” or “Orphanmaker” – you’re naming the sword after the wailing and mourning of your foes and their agonized loved ones. Think about the idea of the Starks and mourning – you may recall that the signature Stark look is a long and melancholy face, and that this look is even matched by the heart tree in the Winterfell godswood, which is also described as having a long and melancholy face. It’s kind of a theme for House Stark – they are melancholy and have lots of reasons to mourn, basically every time a Stark goes south of the Neck. Ravenous Reader has further connected this idea to the Sorrowful Men – the assassins guild which tried to kill Daenerys in Qarth with a Manticore, and to Azor Ahai himself was sorrowful before he slew Nissa Nissa, according to legend – it says “Great was his woe and great was his sorrow then, for he knew what he must do.” If you think about, both Ned and Jon’s arcs have them repeatedly doing things they do not want to doe and feeling anguished about it. I don’t want to go on and on, but the point is that the idea of the Starks as Black Swords of Mourning does indeed fit the theme of their house and it’s main figures. Martin is making a comment the idea that sometimes you have to do a wrong or dishonorable thing for a noble reason – if you find it necessary to do something like this, even though it’s for a greater good, you do not get excused from paying the price for your sin. That’s what it means to sacrifice your honor to save the day – you accept the dishonor and the punishment for your deed. The Starks and the Night’s Watch, and Coldhands in particular, seem to fit this theme. Anyway, that’s how you get a black sword of the morning. I mean, I dunno, I don’t write the books, I just happened to notice that the only times when swords run with morning light, they are Stark swords, and they are usually black. All the Stark sword symbolism is black, essentially, just like the Night’s Watch – another group dedicated to ending Long Nights and bringing the dawn. So, I guess we can say that the Starks have a weird sort of inverted Sword of the Morning symbolism – the symbolism is there, but it’s more black than white. More Evenstar than Morningstar, perhaps. While the Daynes speak of morning and daytime, the Starks are talking about “winter is coming,” which is more akin to sunset and nighttime, especially considering that the winter they are really warning about is the possibility of another Long Night, which is a long winter. As we know, Night’s King was said to be a Stark, which is yet another association with Starks and darkness. Heck, five out of six of their direwolves are called “dark,” the stone of Winterfell and the Stark throne is called dark stone, and the Kings of Winter famously sit their thrones in eternal darkness, the symbolic wardens of Hades and the underworld. Now it begins – a statement of daytime and dawn. Now it ends – a statement of night time and sunset. The man who likes to say winter is coming might as well have said night is coming, like “eff you, Mr. Sword of the Morning McSunshinepants! Winter is coming, now it ends! Life is PAIN!! !” You’ll also notice Ned’s voice is filled with sadness here – it’s a great example of Ned and Jon always having to do things they hate and being sad, morose, melancholy, and yes, mournful about it. Of course, as always, everything is inverted, as even though we see these clear daytime and beginning themes with Arthur Dayne, and the exact opposite with Mr. Now it Ends and his grey wraiths, we know that the black clad Night’s Watch are fighting to bring the dawn, and the white shadow Others are the ones who think the Long Night is super awesome and fun. The Tower of Joy is a seven layer cake of symbolism, is what I’m saying, and also, “George Martin likes paradoxes.” Still, we know enough to figure out what is going on here. Kingsguard symbolize Others, time and time again, and they guard an ice moon queen with an icy white sword (and of course the Kingsguard are themselves white swords from the White Sword Tower). So what about those grey wraiths with “shadowswords” who stand at Ned’s side? Well, we’ve also seen that “shadowsword” term applied to the sword of the shadowbaby that killed Renly, which is implied as a representation of Lightbringer when it is described as “the shadow of a sword that wasn’t there,” meaning’s Stannis’s Lightbringer. This would imply Ned’s wraiths as being similar to shadowbabies wielding dark Lightbringers, which doesn’t appear to make sense – except when we remember that the Night’s Watch are black shadows with black swords who symbolically parallel the shadowbabies. In addition to this common black sword and black shadow symbolism, the Night’s Watch brothers and the shadowbabies are both symbols of burning black meteors, and there are a pair of quotes from fiery weirwood goddess figures that make the comparison even more plain. First, the Ghost of High Heart dreams of the shadowbaby that murdered Renly, saying “I dreamt I saw a shadow with a burning heart,” and then later Melisandre speaks of the type of men who can battle the Others, saying that they need “true men… whose hearts are fire.” Those would be the Black Brothers she’s alluding to, men who are black shadows… but who need burning hearts. Even better if they have actual burning hearts, like fire wights, heh. Therefore, we can see Ned’s grey wraiths with shadowswords as stand-ins for the Night’s Watch – which makes sense, because after all, standing opposite Ned’s crew are three Kingsguard, who seem basically designed to symbolize the Others. This is simply another version of the classic showdown – and of course the Stark in Winterfell would lead the Watch. As a matter of fact… we’ve actually seen the “shadowsword” term applied to Ned’s Ice, when Theon thinks about “the long steel shadow of his greatsword” always lying between them, and perhaps even when Oathkeeper becomes a “grey blur” in Brienne’s hands. Ned’s sword is called smoke-dark, and of course the smoke of the Long Night is what shadowed the land. At the end of the day, we can basically say that the Night’s Watch and the Shadowbabies are also symbolically equivalent to Valyrian steel swords – they all the share the same black sword, black shadow, and black meteor symbolism, with all of those things throwing in a dash of fire. This, to me, is exactly the context in which we should see Ned’s grey wraiths at the Tower of Joy – Ned is essentially leading the Watch against the Others to steal an Other baby and the big white ice sword. In any case, I say Stark and Dayne could almost represent the light and darkness of the Azor Ahai archetype, because, true to the yin yang message about each side containing an aspect of its opposite, the bright white daytime associations of the Daynes are marred by the likes of the dastardly “Darkstar” Dayne who claims to be “of the night,” and Vorian Dayne, who was called the “Sword of the Evening.” I know – just when it all seemed so clear, so…. black and white. And as I am fond of pointing out, Vorian Dayne the Evening Sword was sent to the Wall in golden fetters by Nymeria when she conquered Dorne – this sure seems like an important War for the Dawn echo. It seems like a depiction of Azor Ahai – an “evil Dayne,” so to speak – being sent to the Wall to become the Night’s King, or maybe even the last hero. Although it is not said that Vorian carried Dawn, he is called “the greatest knight in all of Dorne,” as well as “the last king of the Torrentine,” because the Daynes styled themselves as kings before Nymeria came. So, the greatest knight in Dorne, and a King Dayne? Seems like he would have wielded Dawn (and Aziz from Westeor s agreed with me that this seems likely, fwiw) – and if so, he’d be like a Night’s King / Evenstar figure, wielding Dawn, which would be cool. Obviously if he did wield Dawn, he would not have brought it with him to the Wall, but the original event Vorian may be echoing probably would have involved Dawn or some other magic sword going north. Check out the crew that went to the Wall with Vorian Dayne: Yorick Yrownood, Garrison Fowler, Lucifer Dryland, Benedict Blackmont, and Albin Manwoody. “Yorick” is a name primarily associated with a skull in Hamlet, and Yronwood trees are black trees; House Blackmont gave us the Vulture King and are rumored skinchangers and baby-stealers; and Lucifer Dryland is not only named Lucifer, he is King of the Brimstone and Lord of Hellgate Hall, and the last of his line. House Manwoody is a metaphor for a dead greenseer going into a weirwood: they hail from Kingsgrave, emblazon their arms with a crowned skull on a black field, and call themselves “man-wood.” Were means “man,” as in “were-wolf,” so a weirwood can be thought of as a man-tree, and obviously they are man-trees. They are the graves of greenseers, who are the kings in the grave. Point being, this crew is headed to the Night’s Watch. Lucifer Dryland and the Sword of the Evening Dayne and a dead greenseer, plus a house known for sinister skinchanging practices. They’ll make excellent green zombie Night’s Watch brothers, or perhaps we can see all six of these people as having redundant Night’s King symbolism. You don’t send guys like Lucifer somebody and somebody somebody Sword of the Evening to the Wall without grabbing our attention, that’s for sure. Finally, wrapping up the thread of night-associated, evil Daynes, there’s a Samwell “Starfire” Dayne who sacks and burns Oldtown. Given Oldtown’s white lighthouse tower sigil and “we light the way” house words, you could also interpret Samwell Starfire Dayne as an evil Dayne type who is not a fan of lighting the way, unless its with a bonfire of destruction. Oldtown also represents the flame of knowledge and learning, and burning it is tantamount to extinguishing those things. Of course, we can’t hear the name Samwell without thinking of our beloved Samwell Tarly, and though his battle prowess probably doesn’t compare well to his Dayne namesake, Sam is nevertheless a Night’s Watch brother who slays Others with dragonglass, slays wights with fire, and who smuggles Other babies through the Nightfort. All Night’s Watchmen symbolize fiery black meteors, so even the starfire monicker fits Sam Tarly in a symbolic sense. In other words, Samwell Dayne is a Dayne with a rescuer name, and that’s noteworthy, because one idea that we have is that the person who rescues the Night’s Queen baby is a Dayne.. Also noteworthy is that both Samwells go to Oldtown – is this foreshadowing that Sam will set some part of Oldtown on fire? The library, perhaps, after stealing all the old books? Maybe George will do a library of Alexandria thing… or more likely, Euron will set things on fire while Sam Tarly is there, doing something heroic like… rescuing books. More to the point of highlighting the streak of Daynes associated with night and darkness, Samwell Dayne shares a name with a Night’s Watch brother, which conveys black sword and black shadow symbolism on to Sam the Starfire and makes him very comparable to Vorian Dayne, who actually joined the Night’s Watch… so he could be a true sword of the evening until his dying day, I assume. So, Samwell Dayne, Vorian Sword of the Evening Dayne, and Darkstar Dayne. Living ‘in the shadow’ of the Palestone Sword, you might say. Likewise, the Stark symbolism is not completely one sided; even though the Night’s King is said by Old Nan to be a Stark, most people think the last hero was a Stark too, as we just discussed, and even according to classic legend, Brandon the Breaker Stark was one of the men who ended the rule of Night’s King. If Dawn really was the original Ice, this Stark Last hero may have carried it. All of that business about the Starks being concerned with the Others and the Long Night implies they want to bring the day, despite their dark symbolism. Just as the ostensibly day-associated Daynes produce the occasional Darkstar or Sword of the Evening, the Starks confound their associations with Night’s King, darkness, and winter by producing the offshoot House Karstark, who are called “white star wolves” due to their white sunburst-on-black sigil. That reminds us of the bright white star in the hilt of the Sword of the Morning constellation, another daytime association. That white sunburst sigil is also called “the sun of winter,” which sounds something like a light in the darkness type of thing, or perhaps a sun that’s gone underground to the “cave of night” as it is said in one of Jon’s wolf dreams. There’s also a King in the North named “Edwyn the Spring King” Stark which is great because Edwyn is an Eldric variant. as well as expressions of both sides of a dichotomy like “Benjen the Sweet” and “Benjen the Bitter;” Brandon the Shipwright, who built ships, and then Brandon the Burner, who burned ships. Most of all, the Starks swords are the only ones who get the morning light symbolism, even though all of their sword symbolism is black. In that they are like the Night’s Watch, who are similarly dedicated to bringing the dawn. The way to look at this situation, like I was saying, is to think of Stark and Dayne as the two sides of the coin that is the Westerosi legacy of Azor Ahai. Both houses manifest both sides of the light and dark, morningstar / evenstar dichotomy, even if each generally favors one side more than the other. That, I think, is why both houses are showing us this Eldric symbolism, and why both are showing us Sword of the Morning symbolism. After all, the Morningstar and Evenstar have opposite behavior, one rising in the morning and one falling in the evening – but they are really just the same star, Venus, alternating between two different positions. These connections between Stark and Dayne also get us closer to understanding how Dawn could have once been the original Ice of House Stark and then ended up in Dayne hands after the Long Night. We first started discussing this idea in Moons of Ice and Fire 2: Dawn of the Others, when we began looking at Ned bringing Dawn to Starfall after defeating Arthur Dayne at the Tower of Joy as an echo of the past, when the King of Winter brought his white sword to Starfall after the Long Night and left it there, for some reason we haven’t guessed. Since then we’ve done more research and opened up some interesting possibilities regarding the various potential origins for Dawn, but regardless of where and how Dawn was originally forged, I’m still convinced of two basic truths: Dawn is in some sense the original Ice of House Stark, and we are supposed to look at a Stark delivering Dawn to Starfall as an important historical echo. However, I’m not happy leaving it there, and as we discussed a moment ago, the telling of the last hero story seems to imply that he acquired his dragonsteel sword in the north, which opens up the possibility that Dawn is that dragonsteel sword and that it actually has a northern, icy origin, as the symbolism implies. This would explain why a Stark King of Winter figure would have it to bring south in the first place. Given that the Kingsguard at the Tower of Joy can symbolize Others, and are in service to a Night’s King figure in Rhaegar, and given that Ned’s shadowsword-armed wraiths seem to represent the Night’s Watch, I find that I cannot see this scene as anything other than a heroic Ned leading the Watch against the Others to steal an Other baby and their big white sword. That might be one of the best clues for a northern origin for Dawn around – Ned claims it from the same place that he claims his Night’s Queen baby. “I shall remain Darkstar, I think. At least it is mine own.” He unsheathed his longsword, sat upon the lip of the dry well, and began to hone the blade with an oilstone. Arianne watched him warily. He is highborn enough to make a worthy consort, she thought. Father would question my good sense, but our children would be as beautiful as dragonlords. If there was a handsomer man in Dorne, she did not know him. Ser Gerold Dayne had an aquiline nose, high cheekbones, a strong jaw. He kept his face clean-shaven, but his thick hair fell to his collar like a silver glacier, divided by a streak of midnight black. He has a cruel mouth, though, and a crueler tongue. His eyes seemed black as he sat outlined against the dying sun, sharpening his steel, but she had looked at them from a closer vantage and she knew that they were purple. Dark purple. Dark and angry. His hair fell like a silver glacier, divided by a streak of midnight black. Folks, if the dragon locked in ice could be hair, well, this is what it would look like: a streak of darkness locked in a silver glacier. A falling silver glacier, we should not fail to note, as that’s an ice moon disaster prophecy, I do believe, one of many. Darkstar, who also stands “half in starlight, half in shadow” in this chapter, was also honing his sword with an oilstone, which makes us think of oily black stone and black meteor swords. So, here is a dark-eyed dragonlord looking dude, but he’s an Evenstar figure who is “of the night,” with dragon locked in ice symbolism in his hair. Sure seems like a Night’s King type to me! And for those who like puns, there does seem to be a running hair / heir pun, one which features prominently in Ned using hair color to figure out that Joffrey was not in fact Robert’s heir. If Darkstar is Night’s King, the dragon locked in ice represent his seed and his soul – and his seed would be his heir. And look, right there in his hair – a streak of darkness locked in a silver glacier. It’s Darkstar’s seed… which would look like a dragonlord, according to Arianne, but would be locked in that glacier. And so, if we see Darkstar wielding Dawn, or better yet if he eventually becomes part of fAegon Blackfyre’s kingsguard and puts on the white, he’s be a Night’s King figure wielding Dawn, as Vorian Dayne may have been, and he’ll be fighting with alongside his white shadow brothers. I find myself quite attracted to this scenario, as it really clarifies the Tower of Joy symbolism clear – Ned is claiming both the original ice sword and the stolen Other baby from the Others and the Night’s Queen. If Darkstar gets Dawn, we’ll have to see just who comes along and takes it from him, and I’d expect that scene to echo the Tower of Joy if it happens. To sort of put a bow on all this black and white, Stark and Dayne stuff, I’ll simply point out that Martin, the great defiler of tropes, cannot resist giving us example after example of shining white, spotless-looking Kingsguard knights of noble birth who are in actuality horrible, horrible people. Sandor Clegane’s vulgar commentary on the honor of knights is a actually stunningly clear indictment of this kind of falsehood. Conversely, George shows us the Night’s Watch as an opposite of the Kingsguard – made of the lowborn, outcasts and criminals, wearing cheap and threadbare black rags, and yet possessed of the most important duty in the realm – guarding the realm of men from the Others. They aren’t all perfect by any means, but men like Lord Commander Mormont, Benjen Stark, Donaly Noye, etc., have more honor than anyone we’ve seen in the Kingsguard. Don’t forget the great Gerold Hightower watched mad King Aerys torture Brandon and Rickard Stark, and afterward lectured Jaime on how they are not there to judge. Similarly, Arthur Dayne stood silent and did nothing about Aerys’ wild violations of the feudal contract, and in the end, he, Gerold Hightower, and Oswell Whent were effectively keeping a pregnant and dying Lyanna prisoner in a tower, which is kinda messed up. In my opinion, none of the Kingsgaurd who served Aerys to the end had any honor to speak of. At the end of the day, the monsters can come in white or black, and in ice or fire. We have white ice demons and demonic black dragons, and we have both black and white swords with symbolism that is suggestive of ending the Long Night. The Daynes and Starks seem to be the epicenter some kind of yin and yang, Morningstar and Evenstar dichotomy of symbolism, one that appears to define the concept of the sword of the morning and the last hero. And standing there at that crossroads and staring back at us through the mists of centuries and eons is a man named Eldric Shadowchaser. Since we’ve broken out the Lord of the Rings stuff – the Silmarillion, really – I suppose I should mention that the tradition of magical black swords is not only strong with the Starks and Targaryens, and with Elric and his friends from Melnibone. That’s right, not only does the Silmarillion give us white and red flaming swords wielded by people who sound like Daynes, it also has a strong helping of black meteor swords with magical properties! There was actually a pair of black meteor swords, and they sound a damn lot like my theory about Azor Ahai’s “dark Lightbringer” being a black sword made from the same black meteorite spoken of in the Bloodstone Emperor myth. They were forged by the dark elf Eöl, and they were named Anguirel (“Iron of the Eternal Star”) and Anglachel (“Iron of the Flaming Star”). That’s somewhat reminiscent of Widow’s Wail and Oathkeeper, I would think, or perhaps Blackfyre and Dark Sister. Like Valyrian steel, these black swords were well-nigh unbreakable and could shatter any terrestrial steel swords. Anglachel in particular is worth noting, as it is said to be a sentient sword, much like Eldric of Melnibone’s Stormbringer or like Lightbringer being infused with Nissa Nissa’s soul and spirit. Anglachel (seriously, that’s a great name for a metal band) was even reforged and renamed Gurthang, which means “Iron of Death,” and was used to kill Glaurung, the first and most magical dragon of Tolkien’s universe who, according to Tolkien, sired the rest of dragonkind. The most important wielder of Anglachel, an elf named Turin [EDIT – Turin is a man who was considered elf-like, but was not an elf] became known as “Mormegil, the Blacksword of Nargothrond” after Anglachel was reforged and named Gurthang. I don’t need to tell you that may be the origin of Barth Blacksword’s nickname, though the Eldric tales use the blacksword term as well. Eöl, the dark elf who forged Anglachel and Anguirel, has a sort of familiar family drama going on – he takes an elven wife against custom Reminding us of Azor Ahai taking a child of the forest wife) and prevents her and her son Maeglin from leaving his wood… which they eventually do anyway, when Maeglin was twelve, stealing Anguirel as they left… which reminds me of the time when Maegor the Cruel was about to die, and Queen Rhaena fled Kings Landing, stealing Blackfyre for her son Jaehaerys to wield. They fled to elven court and were followed by Eöl, whom the Eleven king ended up executing by throwing him off the cliffs of Gondolin – but not before he cursed his son Maeglin to die the same way. He also killed his wife, Aredhel, when she stepped in front of a thrown spear meant for Maeglin (shades of Azor Ahai killing Nissa Nissa with Lightbringer there for sure). Maeglin – like Maegor the cruel – is remembered as the most evil elf ever, for he alone willingly served Morgoth and eventually betrayed Gondolin. He was thrown from the walls of the city during combat, as the curse promised, and overall I’d say the idea of a cursed black sword comes through pretty strong here. The other black meteor sword, Anglachel-turned-Gurthang, was involved in a tragic story involving a friend stabbing another friend by accident, then committing suicide – Gurthang was even said to “mourn” over the slaying of Beleg at the hand of his friend Túrin, making it a black sword of mourning or a black “Mourneblade.” Again we have to think of Elric’s cursed Stormbringer and the notion of Lightbringer as an evil black weapon that drinks the blood of those it slays. Ned was even slain by his own “Black Ice” sword, which is reminiscent of Túrin being slain by his own black sword, Gurthang (though Túrin committed suicide and Ned did not). Alright my fine friends, it’s time for me to say “now it ends.” But only for three days, as I’ll be back in three days with Blood of the Other 3: Eldric Shadowchaser. Then we’ll have our livestream a week after that on Saturday April 7th, at 3:00 EST, so send in your questions and I’ll see you there. Do you know of the scientific theory that Venus was a comet that came through the solar system, had a magnetic encounter with Mars (killing the planet with a very very large spark), which sent Venus reeling like a pinball into a caught orbit around the sun. It spins at high speeds and is in every way not a normal planet. It is historically referred to as both the Evening and the Morning star because it retrogrades for some months slightly below the ecliptic of the sun, yet it reappears eventually as its orbit brings it slightly above the sun’s ecliptic. Up and down over and over. Yin and Yang, Black and White; Osiris, Tammuz, Adonis and Attis, Dionysus and Jesus Christ. Aphrodite. Now, combine that with the mythology/ancient astronomy that the moon is a direct result of a cosmic encounter with Earth, one that set us tilted on our axis, causing the morning and evening to change directions more than once (Herodotus, the Egyptian visit with the priests). Both the Moon and Venus have a Black and White aspect. There is a black stone meteorite being worshipped at Mecca…all these things are scientific theory and fact, and astronomy, as well as ancient mythology. There is existing mythology that precedes both Venus and the Moon….ancient human consciousness, indeed! I like to look at Martin’s opus here as an even deeper subconscious insight into what has happened to life itself as long as its been evolving and keeping memory logs deep in its chemistry of how it works and what has gone before. When the story doesn’t make sense there is a mythological magic to help it along….that’s the magic that makes it bigger than just a tragedy or a comedy. it is the playing out in a thousand different ways the cosmology of Martin’s world. The ideas he borrowed were already borrowed by Tolkein and Lewis before him, and ancient writers of literature and philosophy well before them…orally passed down before writing was introduced, quite recently. As a side note, what is left now of the Chidren to appeal to for help but their green-seeing descendants Howland Reed and Meera Reed? Thank you for providing the pronunciation for “Melniboné.” I just kept butchering it. I’d love a LOTR/ASOIAF comparison video. The fact that JRRT called his world “Arda” is another proof of how into Norse Mythology he was, especially seen when you consider Middle-Earth is what Midgard translates into, with the “-ard” meaning “earth.” My German isn’t that great, but I believe Erde is how it’s said there. I think about his many of the places in ASOIAF have parallels to the worlds on Yggdrasil (e.g. Muspelheim is Summerhall destroyed by fire, Nifleheim is Winterfell and potentially beyond the Wall in the Lands of Always Winter, Kings Landing is Midgard, the battleground and I’m sure there more but I’m having a brain freeze). I’m currently working on that essay (‘Tolkienic ASOIAF Part I’), it should be ready by mid-May. ‘Middle-earth’ is a real world term, a translation of the Old English ‘middangeard’. Inspiration for both ME and Earendil came from Christ I (or The Advent Lyrics), poetic text from 8th or 9th century. It seems that this ‘middangeard’ was a form of ‘Midgard’ (Miðgarðr), used to refer to ‘the realms of man’ (to use the term from ASOIAF). Earendel is synonymous with Aurvandil (most likely from auzi-wandilaz, luminous wanderer). It probably meant ‘Morningstar’. In the advent poem, Earendel might be St. John the Baptist, who foreshadowed the coming of Christ, just like Venus is the herald of the dawn, the coming of the Sun. And of course, the story of Earendil found in ‘The Silmarillion’ is heavily rooted in what LML calls ‘mythical astronomy’. I would love to listen to a podcast about more of these connections. I save so many of these for my own research and essays. Thank you for that insight and information! Not to nitpick, but the sinking of Beleriand was more likely caused by the battle between the Valar and Morgoth in general, rather then the specific event of the slaying of Ancalagon. I love how developed these connections between LOTR and ASOIAF are in this essay; they are subtle yet powerful at the same time! Thanks for your comment. Yeah, it seems that the sinking of Beleriand had many causes. The War of Wrath was fierce, and mighty beings fought on both sides. Balrogs, other fallen Maiar, dragons, and legions of orcs beyond count. And against the might of the Iron Crown stood the Edain, Eärendil, The Vanyar and those of the Noldor who never left Valinor with Feanor, led by Finarfin. And the great eagles under Thorondor. And all those forces were commended by Eönwë, The Herald of the Elder King himself. It’s likely that numerous other Maiar had a part in this war, and some fans speculate that some of the Valar might have came as well (Tulkas and Ulmo are most often mentioned in those theories). ”Of the march of the host of the Valar to the north of Middle-earth little is said in any tale; for among them went none of those Elves who had dwelt and suffered in the Hither Lands, and who made the histories of those days that still are known; and tidings of these things they only learned long afterwards from their kinsfolk in Aman. But at the last the might of Valinor came up out of the West, and the challenge of the trumpets of Eönwë filled the sky; and Beleriand was ablaze with the glory of their arms, for the host of the Valar were arrayed in forms young and fair and terrible, and the mountains rang beneath their feet. But it availed him not. The Balrogs were destroyed, save some few that fled and hid themselves in caverns inaccessible at the roots of the earth; and the uncounted legions of the Orcs perished like straw in a great fire, or were swept like shrivelled leaves before a burning wind. Few remained to trouble the world for long years after. And such few as were left of the three houses of the Elf-friends, Fathers of Men, fought upon the part of the Valar; and they were avenged in those days for Baragund and Barahir, Galdor and Gundor, Huor and Húrin, and many others of their lords. But a great part of the sons of Men, whether of the people of Uldor or others new-come out of the east, marched with the Enemy; and the Elves do not forget it. But Eärendil came, shining with white flame, and about Vingilot were gathered all the great birds of heaven and Thorondor was their captain, and there was battle in the air all the day and through a dark night of doubt. Before the rising of the sun Eärendil slew Ancalagon the Black, the mightiest of the dragon-host, and cast him from the sky; and he fell upon the towers of Thangorodrim, and they were broken in his ruin. Then the sun rose, and the host of the Valar prevailed, and well-nigh all the dragons were destroyed; and all the pits of Morgoth were broken and unroofed, and the might of the Valar descended into the deeps of the earth. There Morgoth stood at last at bay, and yet unvaliant. He fled into the deepest of his mines, and sued for peace and pardon; but his feet were hewn from under him, and he was hurled upon his face. Then he was bound with the chain Angainor which he had worn aforetime, and his iron crown they beat into a collar for his neck, and his head was bowed upon his knees. And the two Silmarils which remained to Morgoth were taken from his crown, and they shone unsullied beneath the sky; and Eönwë took them, and guarded them. ”Of Númenor he spoke, its glory and its fall, and the return of the Kings of Men to Middle-earth out of the deeps of the Sea, borne upon the wings of storm. Then Elendil the Tall and his mighty sons, Isildur and Anárion, became great lords; and the North-realm they made in Arnor, and the South-realm in Gondor above the mouths of Anduin. But Sauron of Mordor assailed them, and they made the Last Alliance of Elves and Men, and the hosts of Gil-galad and Elendil were mustered in Arnor. ‘So it was indeed,’ answered Elrond gravely. `But my memory reaches back even to the Elder Days. Eärendil was my sire, who was born in Gondolin before its fall; and my mother was Elwing, daughter of Dior, son of Lúthien of Doriath. I have seen three ages in the West of the world, and many defeats, and many fruitless victories. It seems that destruction of Thangorodrim caused by Ancalagon is considered the main cause of the drowning of Beleriand. And if you know LML’s theories, you’ll know why he liked the idea of a giant black dragon sinking green lands upon his landing. Also, this essay was dedicated to ASOIAF, and all that stuff from Prof. Tolkien’s Legendarium was there to support LML’s other theories and ideas. If we tried to explain every aspect of Tolkien’s rich world, this essay would have to be much longer. So some generalistations and simplifications were necessary. For example here LML ommits Turin’s deeds which took place between the slaying of Beleg and slaying of Glaurung (Nargothrond, meeting with Aerin in Dor-lomin, Nienor’s adventures, Mablung sneaking into fallen Nargothrond etc.) – and Turin’s earlier life (Dor-lomin, Doriath, incident with Saeros, his life with the outlaws who called themselves Wolf-Men (Gaurwaith), The Dragon-helm, Mim the dwarf and many others). And that scene where Melian and Thingol send Beleg on his way, saying that Beleg can choose any sword but the king’s own blade, and he takes Anglachel. ”Then Beleg chose Anglachel; and that was a sword of great worth, and it was so named because it was made of iron that fell from heaven as a blazing star; it would cleave all earth-delved iron. One other sword only in Middle-earth was like to it. That sword does not enter into this tale, though it was made of the same ore by the same smith; and that smith was Eöl the Dark Elf, who took Aredhel Turgon’s sister to wife. He gave Anglachel to Thingol as fee, which he begrudged, for leave to dwell in Nan Elmoth; but its mate Anguirel he kept, until it was stolen from him by Maeglin, his son. Many readers of the Mythical Astronomy should be able to see what’s going on here. But as you see, such explanations take a lot of time and space, and besides that, both LML and I are planning to write other episodes where JRRT-ASOIAF connections are the main focus, not just supporting evidence like here. That response was incredible, thank you. It seems if Lml and you wanted to do LOTR influences on ASOIAF, it would have to be multiple essays rather than just one. I also didn’t see that correlation between the destruction of Thangorodrim to be the ma.in reason for the sinking. Maybe I assumed there was span of time between the two events. I’ve read the Silmarillion a few times, and only briefly read through the Histories. I great really confused about the chronology of Tolkien’s writing, as in the aspects of the story he changed throughout his years of writing. I assume the Histories lay out the timeline more in depth. (I did read the recently released Beren and Luthien chronology, which was super helpful). The dragon falling and the meteorite forged sword…BOOM. That alone is worth essay, at least. Feanor, Numenor, and maybe even the Silmarils (gems, GeotD, etc) all also lend influence, and, I believe, add further credence to Lml’s theories. TLDR – LOTR influence essay/series would be awesome! Túrin Turambar, was a man and not an elf. I strongly recommend reading his tale in ‘The Children of Húrin’ as it is by far the most tragically beautiful of Tolkien’s stories. Here we go again… I think that’ll be the fourth time I have to explain that LML made a typo. And really, it’s becoming annying. All that research, all that effort, one f*** typo, though I spent a lot of time writting commentaries about this LML essay and LML managed to write a perfect summary of months of our LOTR-ASOIAF research, we’re getting only negative comments. If you’re all so smart and good at JRRT-lore, why haven’t you figured this out on your own… And if yet another person sends an annoying message to me, that I’m dumb and should ‘read those books before commenting’, I might explode. Don’t worry about it, people are just trying to be helpful. I knew I’d get something wrong, citing so much Tolkien. Well do a whole episode on Turin and set it straight. No one else had mentioned the typo on this blog until I did, apart from you (which was buried in a long conversation i hadn’t the time to read), so i wasn’t to know the mistake had been acknowledged. Was I? After reading such a complex and thought provoking essay the only input I could possibly make at that juncture was to help correct an issue of accuracy. Perhaps I should have said “great essay LML” but I didn’t think it was needed as he already knows his essays are good… else he wouldn’t post them. Plus I’ve said it many times before, and I do hate to be unoriginal. If the only negative comments you’re getting is about a typo then… Congratulations! You’ve collaborated on a successful essay. Mind. Your. Manners. Golden rule to a succesful conversation on the internet: ‘talk to others as if you were face to face’. So don’t rant at people who, unwittingly, dare to infringe on your ultimate mastery of Tolkien lore :. Not only do I not know (and now not care) who you are, I didn’t know LML had collaborated with anyone else on this essay. I was under the impression his Tolkien knowledge isn’t as thorough as his GRRM knowledge is so I recommended a book to him in the hopes that he might find it helpful but most importantly that he might enjoy it. Yet you seem to have taken this as some sort of personal insult, somehow. It seems to me you’re the one who is becoming far too precious over so small a thing, such a little thing. As I have mentioned, I’ve received numerous messages and comments, on Twitter, YouTube, via private messages. You’re the first one who pointed this out here. I never claimed to have such a mastery. For example, I’ve never read ‘The History of the Middle-earth’, the 12-volume series edited by Christopher Tolkien. yeah, I’lm familar with some ideas presented there, but I’ve never seen those texts. Why? Because they never were translated to Polish (there were fan translations, but they were threatened with legal consequences). + it’s hard to get those books in English anyway, as their circulation isn’t big. c) I’m too young and stupid to understand Tolkien. (I was born in 2000). Because of such comments I became quite bitter towards all JRRT fans I see online. Sorry that I unloaded my feelings upon you. LML had to spend a lot of time convincing me to write anything about Tolkien. And that Turin problem… I’m especially annoyed since I’ve read that essay two times before LML published it, and each time I didn’t look at the ending. ‘OK, Ancalagon, ok Anglachel, ok, well, only one section left, ok, everything’s correct’. ”I must say that I’m dissapointed with my readers. The Mountain vs. the Hammer had 18 views. 18! I’ve spent more hours translating this stuff! I’ve announced my plans to write a JRRT essay, attend that con in June, asked if they had any comments or questions… And I got nothing! Nothing! No one cares what the next ttanslation will be. No one cares when it’ll be ready! To Vurtigone, sorry. And to LML… and to all those people I meet at YT, WordPress, on Twitter and elsewhere, who had to listen to my salty comments. Once again, I’m very sorry if I offended you in any way. With all those parallels between J.R.R. Tolkien’s Legendarium and GRRM’s ASOIAF, LML and I are trying to show that GRRM is not some ‘anti-Tolkien’, like many people like to picture him. From all interviews, it’s obvious that GRRM has a deep respect for Tolkien and is a huge fan of LOTR and Silm. Yes, there are areas where GRRM and JRRT diasagree – but this doesn’t make them some kind of adversaries. Lewis often disagreed with Tolkien, JRRT with C.S… People compare GRRM to JRRT so often that they forget that he’s a different person, completely. It’s natural that there will be things about which GRRM thinks differently than Tolkien did. GRRM says that in the real world/my world, this thing from Tolkien would really look like this. That’s dialogue. And besides that, GRRM is trying to fix the mistakes of many post-Tolkien writers. Basically, he’s doing the same thing Tolkien once did, when he helped to raise the fantasy genre – when Tolkien began writing Silm. and LOTR, nearly all elves in literature were little creatures flying because of magic powder. Tolkien came and said: no, that’s not how the elves would look like if they were real. They’d be similar to humans, but more connected to nature, more devoted to developing their talents, more skilled in arts, metallurgy. Just look at how Feanor, Finrod and Galadriel differ from for example, the elves and fairies from Peter Pan. The ‘elves’ from earlier, medieval literature, like Tautha de Danann, were turned into some festival of stupidity by later authors. But Tolkien decided to do his elves differently. Now GRRM’s doing the same. He comes and sees the pile of **** some post-Tolkien writers turned his ideas into. They copied – and without their own thought, without creativity. They copied elves, dark lords, lost isles of advenced people, hobbits, etc. for the sake of it. Nothing creative, nothing new. The ideas of Tolkien were not developed, they were kept stagnant. There’s a picture on ASOIAF Wiki where Ser Damion Lannister, the Castellan of Casterly Rock, is standing over the bust of Lord Tywin with a cleaning cloth. Or the example Moneo Atreides, the majordomo of Leto II Atreides. Nothing new. Let’s just copy the old ideas over and over again. Because GRRM is different, many readers wrongly assume that he hates Tolkien, that he’s against him. Would a man who does not really really love Tolkien’s Legendarium say: ”They can keep their heaven. When I die, I’d sooner go to middle Earth”? Or make so many references to Tolkien’s works? Feanor, Maedhros, the burning of the Ships (Nymeria, Brandon the Breaker, Feanor), Sansa and Luthien (turning into a bat), Sandor the Hound and Huan, The Hound of the Valar. All those Dunedain-Numenoreans parallels with the Great Empire of the Dawn. Even the term ‘Long Night’ comes from Tolkien. Ser Gladden Wylde, who dies during the ambush of Lannister forces at the Mummer’s Ford vs. the Gladden Fields where Isildur was similarly ambushed by orcs. Thoren Smallwood and Bedwyck climbing a tree vs. Thorin and Bilbo climbing a tree. Dearon of Doriath vs. Dareon of the Night’s Watch. Melian of Doriath vs. Melian of Mole’s Town. Quendi, Those Who Speak vs. The Children of the Forest, Those Who Sing the Song of Earth. Palantiri and glass candles. Barrowlands vs. Barrow-downs. Ser Jacelyn Bywater vs. the Battle of Bywater. Osgiliath and the Starry Sept. Urras Ironfoot vs. Dain II Ironfoot. Nienor Niniel and Nissa Nissa. Elron of the Night’s Watch and Elrond. Castamir the usurper king of Gondor and Castamere, the seat of the would-be usurpers of the Lannister power. Black oily stone and the black Stone of Erech. Qhorin and Hurin, the theme of Kinslaying, Euron’s sigil. Durran Durrandon and Durin. House Lightfoot of the North vs. the Lightfoot hobbit family. Ents and ‘trees turned to warriors’. Aurane’s title ‘Lord of Waters’, vs. Ulmo’s ‘The Lord of the Waters’. The founding of Gondolin and the founding of Braavos. The Hidden Cities of Gondolin and Braavos. Ellenai and Elenna. Hoster’s funeral and Boromir’s funeral. Roac, the raven from Hobbit and the ravens Durran Ravenfriend talked with. The Black Gate of Mordor and Nightsfort. And many, many more parallels. I’ve never read that quote before, I think I will adopt it for my epitaph as I have adopted “Family, Duty, Honor” as my house words. I didn’t read ASOIAF under the light of proffesor Tolkien’s life work so I didn’t catch many of the things you mention, but surely I agree with you: GRRM is not a Tolkien hater by any means. I resisted many years from reading ASOIAF because I believed what people wrongly commented; boy am I glad that I changed my mind in the end. As a reader of ASOIAF and also a fan of Tolkiens work, I tip my hat to your excellent essay, LML. Elen sila lumenn’ omentielvo “A star shines on the hour of our meeting”… or at the hour in which I read this, mind you, for it is midnight in my neck of the woods. Nice to meet you Pablo. I’ve noticed your comment on YouTube the one about Túrin. When LML sent me the draft, I must have overlooked this one. Túrin was called Man-Elf during his stay in Nargothron – Adanedhel. And he was raised at the court of Elu Thingol of Doriath, another elven king. But he was one of the Edain, his father Húrin Thalion, Lord of Dor-lómin sworn to the High King Fingon, was a descendant of the House of Hador, while Túrin mother, Lady Morwen, came from the House of Bëor. Nice to meet tyou, too, Lord Blue Tiger. A long time Tolkiendili, I’m very excited to know that soon you’ll be doing an episode or a live podcast with LML. Oh! and I’m sorry if I sounded rude when I pointed out the “Turin = man not elf” thing; I certainly did not mean anything bad or in a “you should read the books” sense. Nothing further from my intentions as I understand it’s an overlooked detail that takes naught away from the value of LML’s work (and yours). As I always say “No se equivoca el que no trabaja” (no mistakes makes who doesn’t work), so in my book, making mistakes is a good sign; it shows that real people are doing real work and putting an effort in what they produce. Ignore the haters, brother, they’ve only one purpose in life and what a miserable purpose that is, may Mandos have pity on them at his halls should they ever have to tarry there en route to … only Eru knows. Oh, you didn’t sound rude, pointing out such things is good. I guess I’m just being oversensitive about JRRT-related things. And thanks for the kind words in yuor second comment! And Vurtigone, I didn’t want to accuse you of sth like that, I was just a bit angry that I’ve been getting the very same message for the entire morning. LML, could you fix this line: The most important wielder of Anglachel, an elf named Turin, became known as “Mormegil, the Blacksword of Nargothrond” after Anglachel was reforged and named Gurthang. – elf to man. Or ‘one of the Edain’, I guess.